This is the story of a Melbourne Cup Hero. In 2015 at Flemington racecourse near Melbourne in Australia, the stage was set for “the race that stops a nation” - the Melbourne Cup. And unbeknown to the thousands of racegoers who thronged the stands, a cast of disparate racing professionals had assembled to pull off one of the most audacious and unlikely victories the race had ever witnessed in its 155 year history. The clock was ticking down to the 3 pm start and jockey Michelle Payne was concentrating on keeping her mount, Prince Of Penzance as calm and quiet as possible. Prince Of Penzance was sired by the British horse Pentire and his name was a reference to the Cornish town of Penzance. In times past the place was noted as a haven for pirates and it amused Michelle to think that her own pirate of Penzance could slip through the field and make off with the bounty. She knew better than anyone that Prince could get a little fiery before and during a race. After all she had been on him for all of his races bar one and even for his training gallops; she simply did not trust anyone else to ride him. Her boss, the trainer Darren Weir, indulged her in this as he valued her commitment and the special relationship she had developed with the horse. Darren himself as a trainer was a one off; a hard working, down to earth man with an Aussie’s sense of humour. He preferred to train out in the country at Baccarat, rather than join the town based trainers who dominated the Metro Premiership. But In the 2013/2014 season he toppled the Victorian Metro trainer Peter Moody to become the first country based trainer to win the Metro Premiership. As Michelle waited to be loaded into the number one barrier she knew she had her brother Stevie to thank for such a good draw as it would suit the Prince’s running style to be drawn right against the rail. As Prince Of Penzance’s strapper he was responsible for drawing the prime slot of number one barrier. Stephen Payne was one of her 9 older siblings who had all been raised alone by their dad Paddy. Tragically their mum, Mary, had died in a car accident when Michelle was just 6 months old. To make life harder for Stevie he had been born with Down’s Syndrome, but this had not prevented him from making a success of his life. He had been given a chance by Michelle’s boss Darren Weir as a strapper and had rewarded Darren by working hard and proving a success in the yard. Michelle also had reason to be grateful to her boss for even getting the ride today. 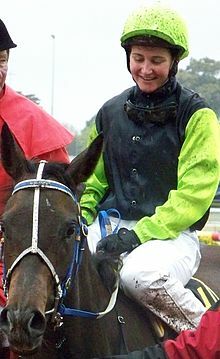 When Weir chose Michelle to ride his horse in the Cup she would be only the 4th female jockey to participate in the race - and the owners didn’t like it. They wanted a male jockey but Weir stuck to his guns and insisted Payne was the best jockey for the horse. As Prince Of Penzance was lead quietly to the stalls Michelle dismissed all thoughts and focussed entirely on the race that was about to start. She had complete faith in her horse; no matter that at $50,000 he had only cost a fraction of the rest of the field; no matter that this would be the first time he would need to keep up a relentless gallop for a lung bursting 2 miles; no matter the punters and bookies considered him a no-hoper with odds of 100/1. It's true that the Melbourne Cup betting is always wide open and even the horses at the head of the market can be as high as 20/1, especially in the ante post market. But even so 100/1 is really the price of an outsider and if anyone was looking for a Melbourne Cup Hero they would surely look elsewhere. In the 2015 race the Japanese horse Fame Game was the favourite at 4/1 and the punters were keen on his chance, closely followed by Ed Dunlop's horse, Trip To Paris at odds of 5/1. But only the Australian horse Sertorius had odds as big as Prince Of Penzance. The starter raised his flag and suddenly the gates sprang open and a wall of horses surged forwards. Michelle tried to remain calm as she cajoled her horse to catch up with the field and although she knew the best position on the inside rail was gone she had worked herself back into contention. Beneath her she sensed that Prince was travelling strongly; he was relaxed and enjoying his own power and the excitement of the race. She too allowed herself to relax and for a moment it seemed that horse and rider were back in Baccarat, flying through the fields with the wind in their face. Gradually she became aware of the roar from the crowd as they rushed by in a blur, the wall of horses surrounding her began to thin. Prince continued his relentless gallop and suddenly she realised her only competitors were to her left against the rail. She urged him to make one last supreme effort and shouted at him as she had never shouted before and Prince Of Penzance, bless his heart, sprinted as he had never sprinted before. All of a sudden they were clear and the line flashed by. She'd Won! She'd won! She'd won! A huge wave of emotion washed over Michelle, she felt numb, her body limp and for a moment she was transported back to her childhood and the time she had said to her school friends; “When I grow up I shall ride a Melbourne Cup Hero and win the Melbourne Cup”.